This is a cute puppy! A golden retriever. Not related to anyone. I hope we have your attention! Those of you who have been around Friendly Water for the World long enough know what puppy pictures mean. 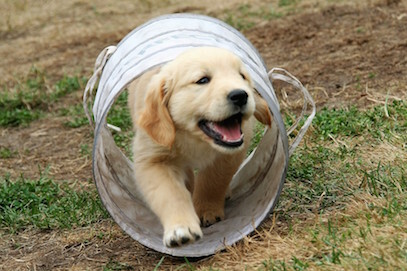 But for those of you who haven’t (or have forgotten) – puppy pictures mean MATCHING FUNDS! Several generous donors wishing to remain anonymous have agreed to match every dollar donated (up to $11,000) for our “Share Hope, Give Thanks, and Empower!” Campaign for Giving Tuesday (November 28th). If you act now! So you can double your/our money. 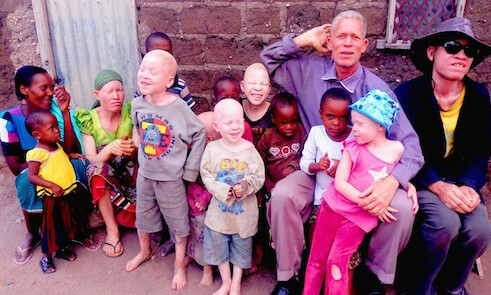 The “Share Hope” campaign will empower an entire community of people with albinism in northern Tanzania. Nine groups of people with albinism will be trained to build, distribute, install, and maintain BioSand Filters, regaining their health in the process, and promoting access to clean drinking water throughout their community. If we raise enough funds, we will follow that up with training in building rainwater catchment systems, to help end the “long walk to water”, often the occasion for attacks (and murders) of people with albinism. Two manual interlocking brickmaking machines will be acquired, so bricks can be made to use in the catchments, to improve housing, and to build MicroFlush toilets. The final stage will be to train yet another group to build and install the toilets. Water, sanitation, and hygiene for an entire community will be transformed. You can read more details of the “Share Hope” campaign here - https://friendlywater.networkforgood.com/ And you can both make donations there (use the DONATE button at the bottom), and share the campaign with your friends (PLEASE). We also have great gifts to go with your donations – you’ll find them on the link. If you have a smartphone, you can do it NOW – Simply text the word "Friendly" to 77498. And, please send us pictures of your favorite puppy, and we’ll include them in a report on the campaign on Facebook, once we’ve met the initial $22,000 goal.